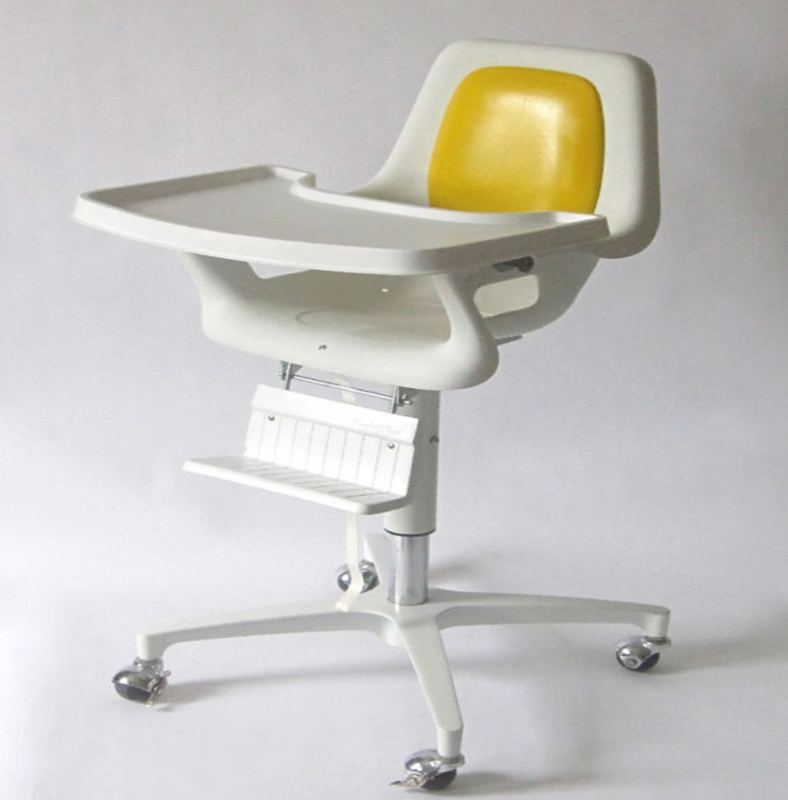 I’ve been putting together images of mid-century and vintage-inspired high chairs for a future post. 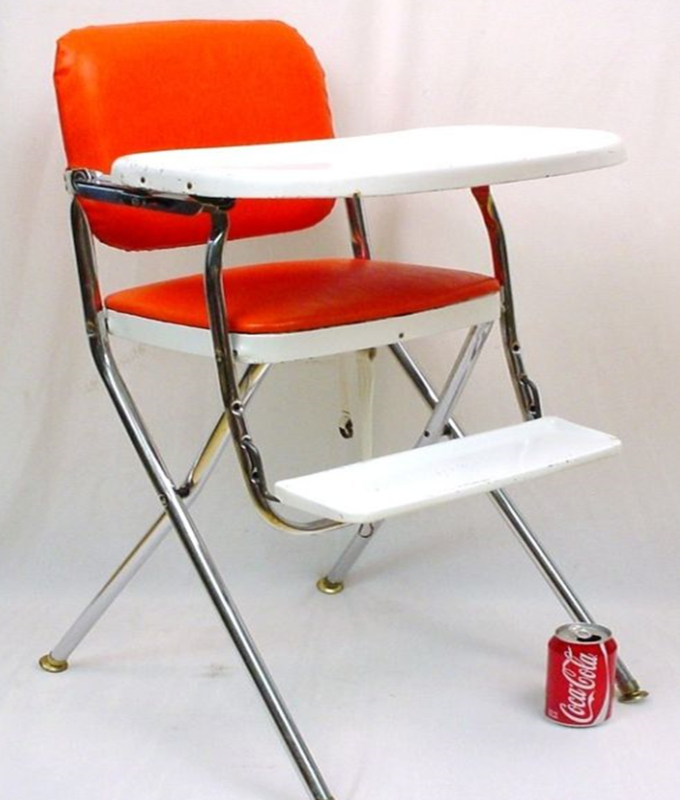 And in my searches, I came across this Cosco “Comfort Line” high chair being sold by “Mikeyboy2020” of Cincinnati on Ebay this week. But there are only four days left for this auction, and was hoping someone might find it as interesting as I have. 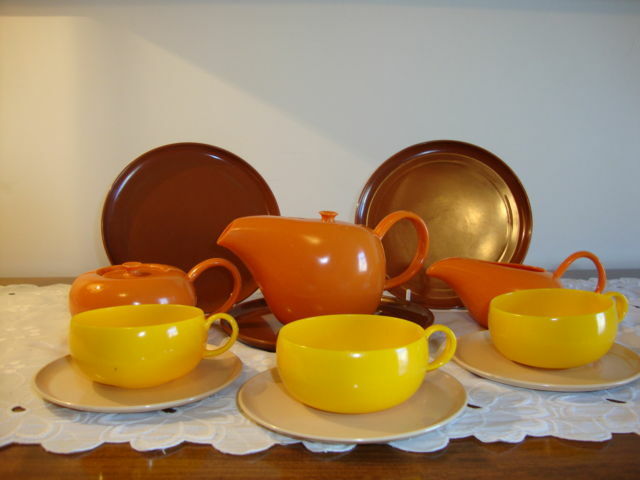 In fact, this is the only vintage Cosco of its kind that I’ve found so far. Apart from a chip on the footrest and the (Very Important) need to attach a new seatbelt strap, the chair is in pretty fantastic shape. I figure that with shipping, you’ll pay a little less than $200 for it. 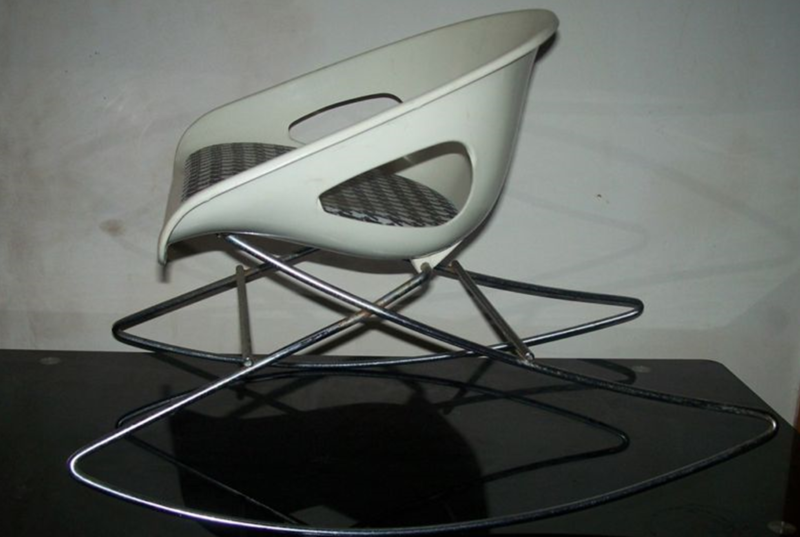 It’s much easier (and cheaper) to find the folding metal chairs similar to the one below (which is in great shape and also available on Ebay), although you might find the chrome needing a touch of polish and the seat requiring a brave scrubbing. It’s definitely very different from the powder-coated-and-animal-print-vinyl versions we’re used to today. 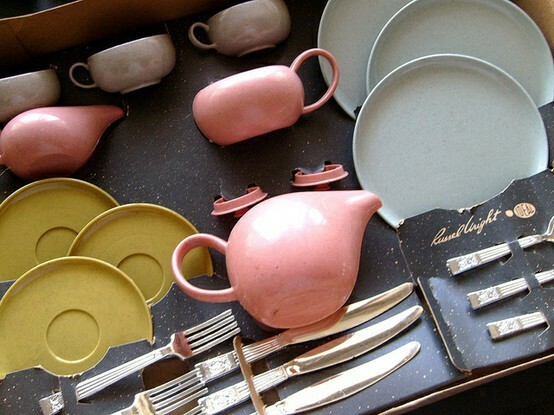 There’s something super cool about the late 60s/early 70s version of Cosco’s eponymous line. My interest was piqued after learning that Fionn’s favorite chair is actually of the same generation of awesome designs to come out of the Hamilton Manufacturing Corporation of Columbus, Indiana. Or if you’re looking for a booster seat, it’s pretty easy to find Fionn’s chair (as discovered by Grandma on Ebay and mentioned above). I actually had no idea that it WAS a booster seat, and an adjustable one at that. Compare these simple, beautiful designs to today’s existing contraptions, and it’s like comparing an Eames lounger to a Bob’s Furniture recliner. And, lastly, the Cosco chair I hesitate to feature, because I kind of want it for my own. 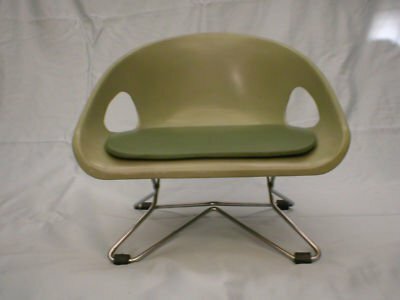 Same as the booster, but a rocking chair, here on Ebay. HOW COOL IS THIS. 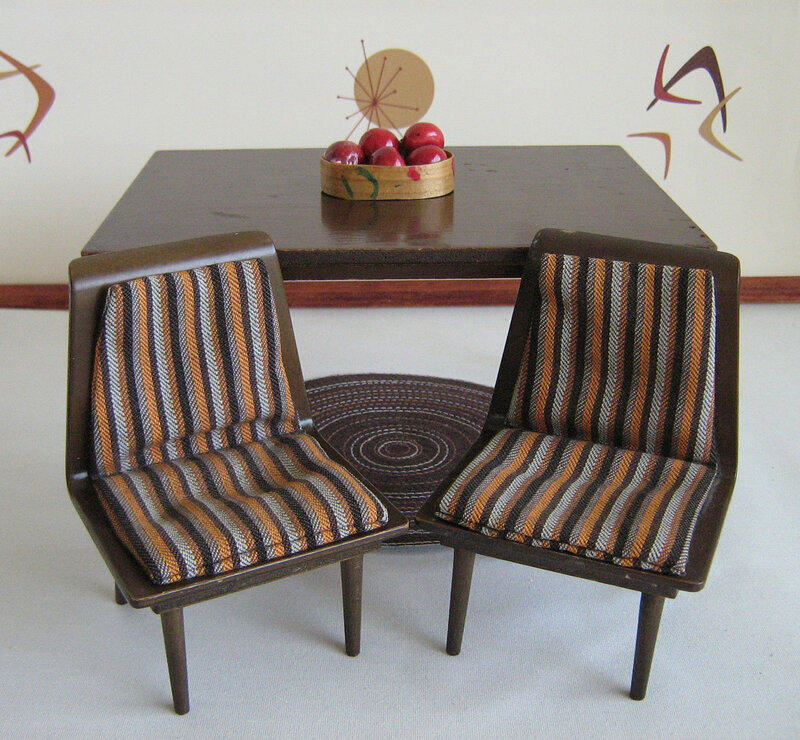 So if you visit the link, and find it sold, here’s the tip I’ll share with you: Antiques > Periods & Styles > Mid-Century Modernism. Always worth a browse. I have a son. And unlike the famous Jenna (J.Crew) whose son famously had his photo snapped while receiving a bright pink pedicure, Fionn is just as well-defined by his dislike of pink and the prospect of having his toes touched at all. This is a short (and probably non-PC) way of saying that there’s probably very little chance of him – anytime soon – enjoying this amazing dollhouse furniture I just discovered by the Mattel company, manufactured in 1958 and sometimes available on Etsy and Ebay. 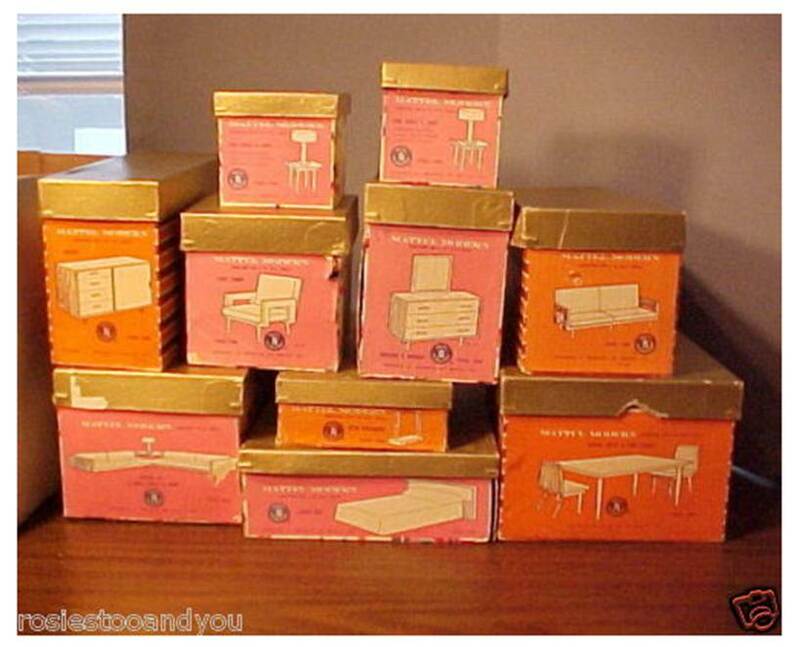 This amazing toy furniture was developed in 1958, a year before the launch of Barbie. But I’m sure Barbie would have loved it. 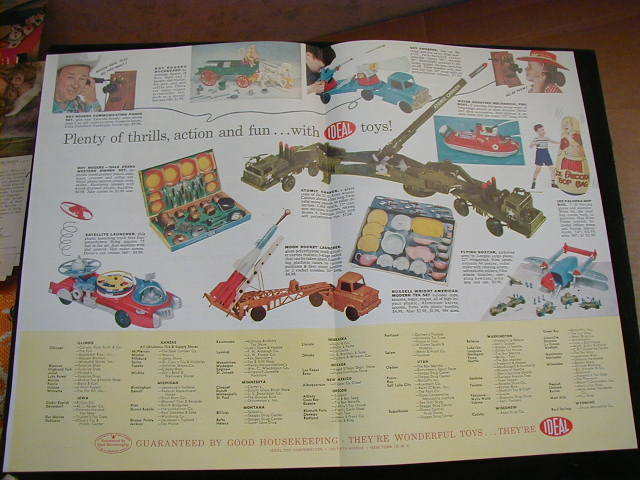 You can see from the top image that this was a limited collection (and a premium one at that, being called “Mattel Modern” from the get-go). The Scandinavian influence is apparent, and it pleases me to no end to learn that a mainstream toy company would have created what us KidRobot fans nowadays call ‘limited edition exclusives’ which may not have appealed to all doll-house-furnishing consumers at the time. 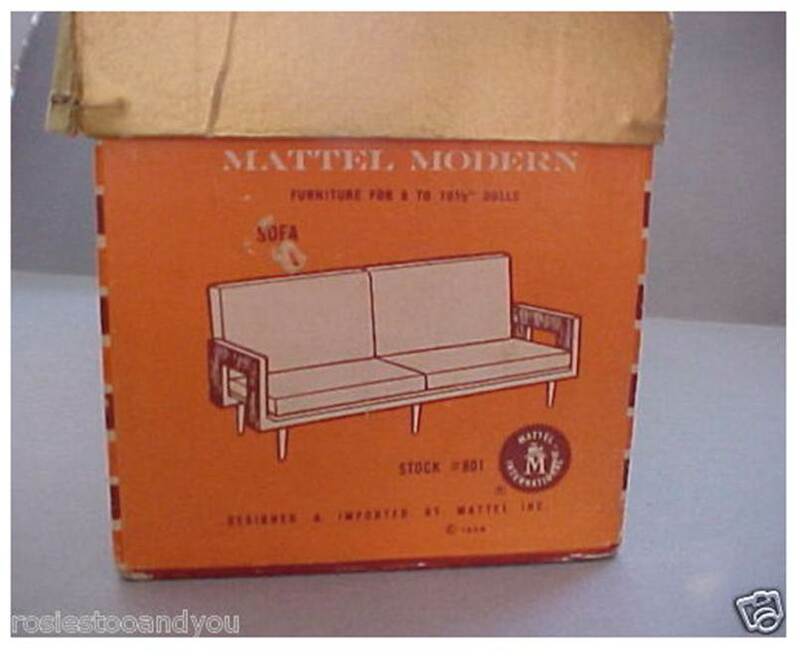 As with most niche mid-century modern furniture fashions, Mattel Modern has inspired a Flickr collection. You must visit these images, if just to see the intense care paid to maintain and reupholster(!) some of these pieces. Even the packaging is fantastic. As of today, I found pieces (as represented by the photos above) at the Rosie Too and You shop on Ebay and the Toy Box (in Texas) on Etsy. Pieces range from $15 to over $100, but compared to those silly Vitra collector’s chairs, it’s quite a deal. Keep an eye on them – at time of posting many of the pieces were already sold, but they seem to be popping up quite often. 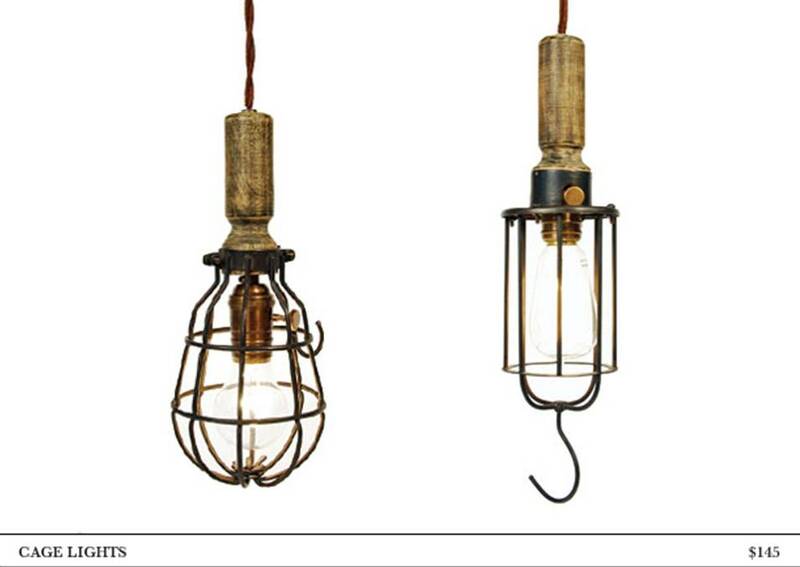 Any additonal detail to add on the origin of these designs? 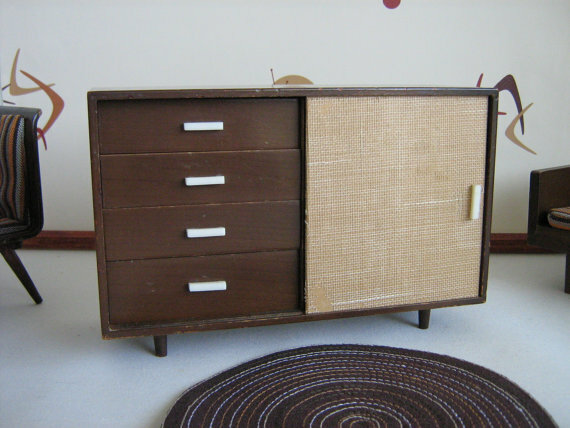 Anyone out there who’s furnished a mid-century dollhouse? Please write! 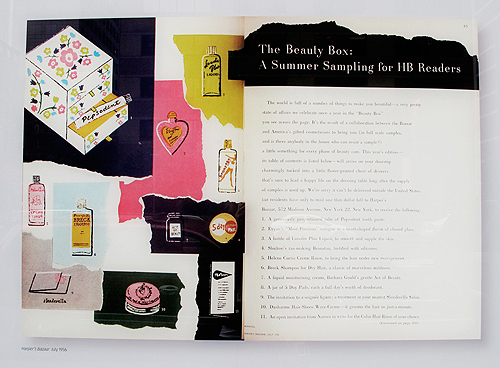 Andy Warhol, as you may know, got his big break at Harper’s Bazaar Magazine. A few months ago, I went to a meeting hosted in the Hearst Tower in Manhattan (the new home to magazines like Bazaar and its friends). And while tripping over my feet staring at the art on the walls outside our conference room (“a Chuck Close is just hanging there…!”) I happened upon an exhibition catalog written on behalf of, and recognizing, Andy’s time at the magazine. Sadly, I missed the actual show and the accompanying party, but it sounded like fun. 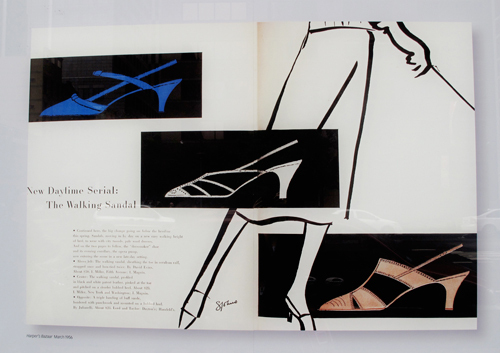 Between 1951 and 1964, Warhol created tons of illustrations and art-directed a handful of spreads for the fashion magazine. And back then, people didn’t keep original artwork – so the only evidence of this work that exists comes from the pages of vintage magazines themselves. I’ve taken the liberty of scanning some spreads (above) from the catalog to share the amazing visual style he displayed early on in his career. 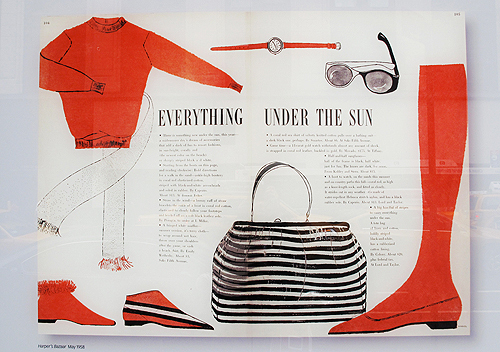 As Charlie Shieps, author of the catalog, described, “His drawing had an idiosyncratic style and visual impact in print that appealed to art directors both for their whimsy and linear elan.” So, in other words, he got work because it appealed to his bosses. An entrepreneur in action. And just as it’s always fascinating to read earlier novels from a writer you’ve just discovered, or listen to back catalog discs from a new band, it’s equally rich to see how Warhol’s work for the magazine was the initial proving ground for his photo-booth portraits, his experimentation with technique (rubber-stamped reproductions as the precursor to silkscreening), and his liberal ‘borrowing’ of source materials. But what I found most interesting about the whole thing was how strongly I found myself attracted to this work, despite not having much of an emotional ‘feeling’ for Warhol in general. (Art history majors would probably tell me that’s the point…) I’ve written about him once before, but never found a reason to mention his own work as a beautiful and decorative option for a bedroom or living room. So I stand corrected. 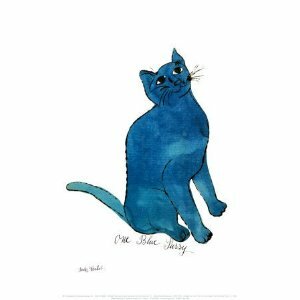 The posters are available at AllPosters.com, here on Amazon, or at Art.com. 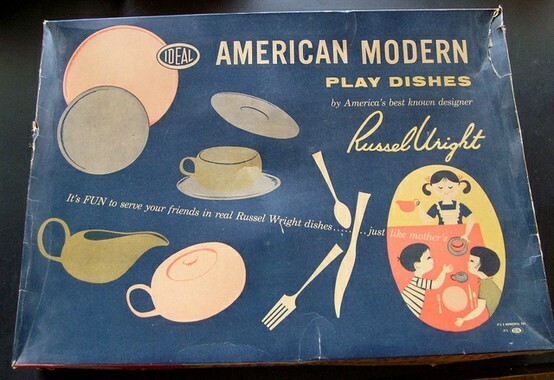 They’re from the same time period as his magazine work – roughly 1956-1958. You can find cats, shoes, (DVF-logo) lips, among other things. They’re a great way to introduce one of our great artists to your kids without having to travel the well-worn Marilyn/soup can route (they’ll find it on their own soon enough). Skipping back a few years from an artist’s famous period is always fascinating… if you’re ever seeking inspiration, it can help you make some interesting discoveries. 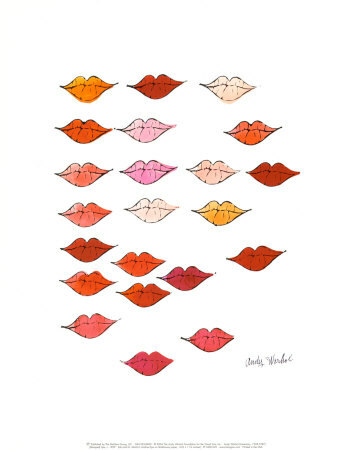 Lastly, here’s a great article by Tama Janowitz on why people miss Andy Warhol. 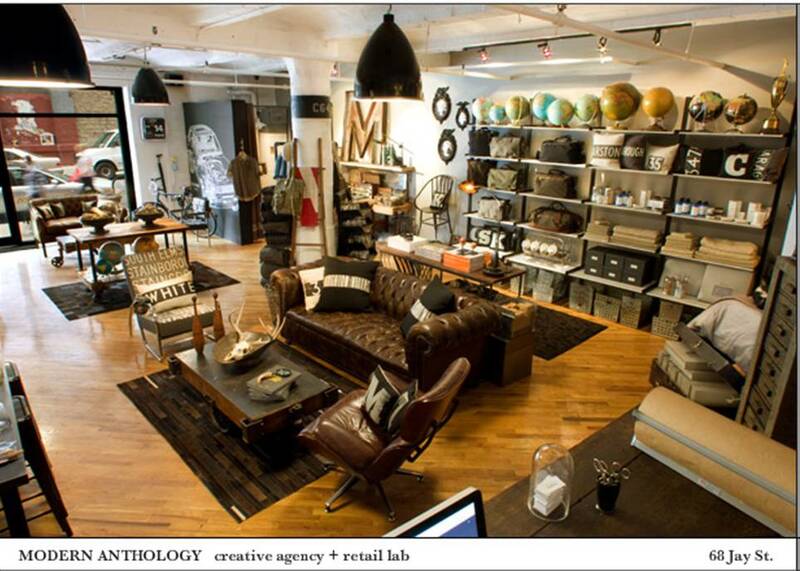 I always love learning about new places in my neighborhood, especially when they’re shops. Was going through my (junk) email this morning and saw this post by Daily Candy about custom wallpaper, designed by a UK company and available exclusively in the US through a company called Modern Anthropology. Then I found their shop on the site. 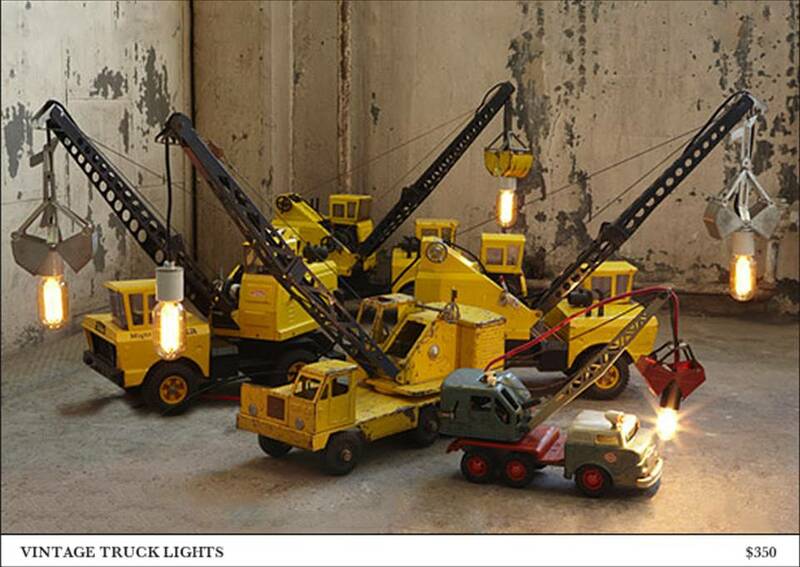 LOVE LOVE LOVE these vintage truck lamps. The only drawback I see is that you’d have to keep your kid from wanting to play with them. 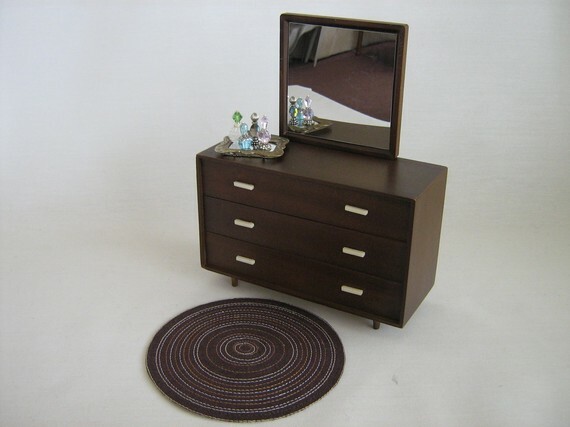 They sell a few other things I think would make great accents to a modern, bright kid’s room. 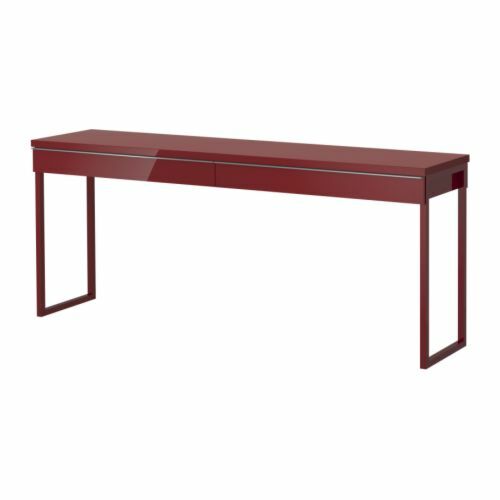 Take this IKEA Besta Burs lacquered desk ($299), for example, and add one of Modern Anthology’s cage lamps to ‘authenticate’ the space a little more, without looking like a construction site. 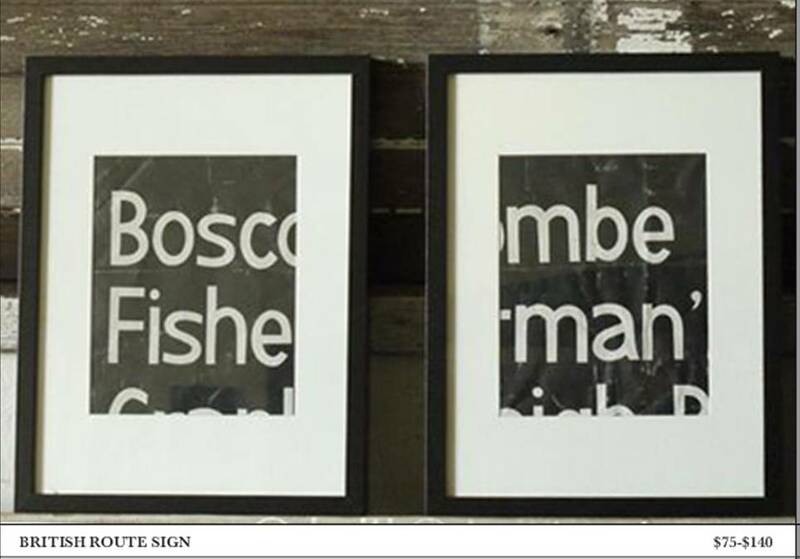 And a perpetual favorite, done in a new way… A bus route sign, cut down the middle and framed as two images. I don’t know if these prices are per image, framed or unframed, but if you’re in the market, they’re definitely worth investigating. Thank you for making 2010 such a wonderful year. Thank you for reading my posts. Thank you for leaving your comments. Thank you for your friendship and help. And thank you for your patience and for coming back despite my lack of writing and low output over the past two months. When I accepted this new job, I was asked on more than one occasion whether I’d pack it up and pack in Room For Young Ones. And I vehemently said “NO,” offended at the notion that I couldn’t keep up with a full time work schedule, an hour-and-a-half-til-bedtime evening with my son, and some TV watching with my husband. Because I was just as busy, and just as tired, spending my days with Fionn at home in Brooklyn, probably even more so than I would be at work. Sixty-something days later, I think I’ve completed two or three posts. Guess I didn’t count on being completely mentally drained at the end of the day, without time or energy to start surfing the twitters and the websites, trying to figure out new ways to think about cool things. So here’s my early New Year’s resolution. Hope to come back with a post a week, as promised. But I’d love to hear from you. Should I keep it up? Would you be interested in reading more? Anything in particular? The thing I love more than anything is helping people find design things – stuff for themselves and their kids, stuff that solves problems or just makes the day a little brighter. So let me know. 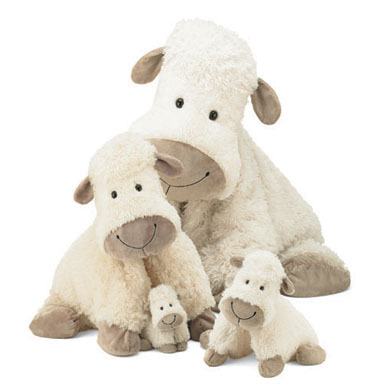 I want you all to have a happy holiday season full of love, happiness, and Jellycats. 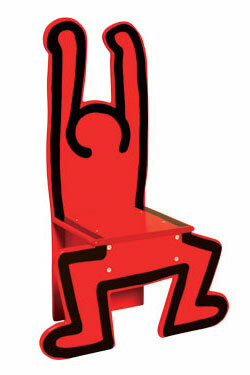 Although I’ve always loved the idea of Keith Haring, I’ve never been a true fan of his work. But I think the passage of time has caused me to reconsider my feelings. Don’t know whether it’s nostalgia for those junior high school trips to Pop Shop in the Village (Returning to school with a Radiant Baby notebook was the end-all-be-all for the Scunci set in Long Island), or a recognition of Haring’s pioneering approach towards graffiti-as-commercialism (e.g. people going nutty over Banksy today). 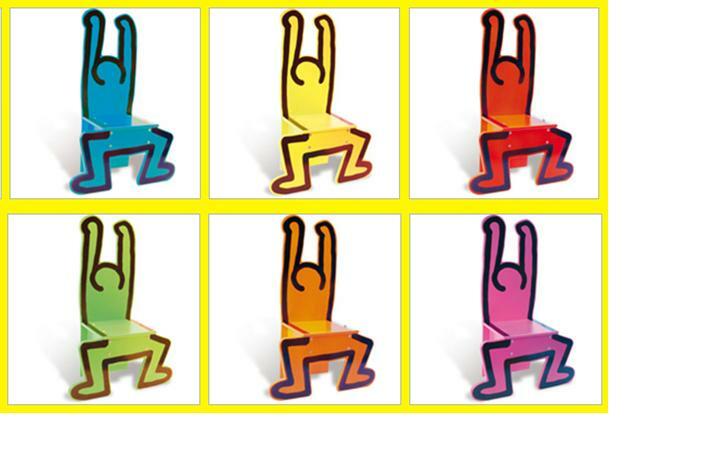 Regardless, I was moved enough to publish my first post in ages after seeing this chair on the New York Magazine website. 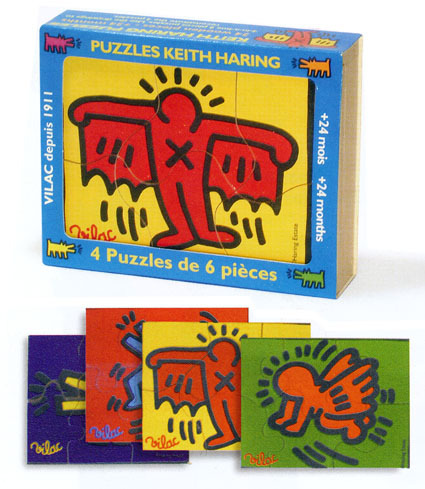 If you’re not in the market for a new piece of furniture, I’m happy to report that Vilac also sells these Keith Haring puzzles. Here’s a link to the Nova 68 website, which sells the set of four puzzles for $50. Fionn received them as an (early) Christmas gift last week, and I believe they were purchased at one of the NYC museum gift shops! So check online for better prices, if you’re interested, perhaps you’ll get a holiday bargain.